KAWASAKI, Japan, Oct 19, 2018 - (JCN Newswire) - Fujitsu Laboratories Ltd. has developed cooling control technology to make major reductions to electricity usage by datacenter cooling equipment. With the rapid spread of AI services, datacenters now increasingly host high-performance, high-temperature-generating computing systems, and it is expected that the energy consumption associated with these will rise continuously. New ways to reduce energy are in demand, particularly for cooling equipment, which can account for up to 30-50% of total energy consumption in a datacenter. Datacenters are adopting a variety of efforts to conserve energy used for cooling, including the air conditioning devices that bring in colder air from outside or control methods that search for optimal settings to minimize power consumption. Despite these efforts, further steps will be essential to effectively maximize power efficiency. Details of this technology will be presented at the International Conference on Control, Automation, and Systems 2018 (ICCAS2018), an international conference being held in Pyeongchang, South Korea, on October 19. AI and IoT markets are growing at a dramatic pace, and in line with this growth, large-scale computing systems so typical of datacenters are increasingly comprised of high performance, heat-generating devices that specialize in AI processing. Electricity used by datacenters amounts to about 2% of total global electricity consumption, and this figure is likely to grow. This not only promises to impact electricity costs, but also poses a serious burden for the global environment. The most effective way to reduce energy consumption in datacenters is to reduce the electricity usage of cooling equipment, which makes up about half of the datacenters' total power usage. Cooling devices that utilize natural energy in the form of outside air are used to reduce the amount of power needed to maintain datacenter temperatures at acceptable levels. By introducing outside air when it is cooler than the air in the datacenter, temperatures can be controlled with very little energy consumption. However, cooling devices also have humidity control requirements that occasionally conflict with the optimal conditions for temperature, so efficient control has not always been achieved when considering both factors-humidity, as well as temperature. Additionally, datacenter users execute a wide variety of services with different energy consumption, and so the amount of heat emitted by each server tends to change rapidly. In order to achieve further reductions in energy consumption, it is necessary to dynamically control setting values for each cooling device while both maintaining preset management requirements for environmental temperature and humidity for each server, and tracking changes in heat from server equipment. 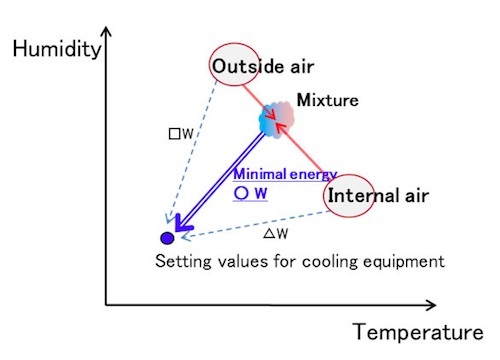 Fujitsu Laboratories has developed algorithms for controlling the intake of outside air to minimize power consumption of cooling equipment, and for efficiently cooling by dynamically identifying heat producing areas. By combining this newly developed system with technology previously developed by Fujitsu Laboratories that predicts temperature changes in datacenters with high accuracy, it is possible to, for example, forecast conditions an hour into the future, and control operations so as to effectively minimize power consumption over time. 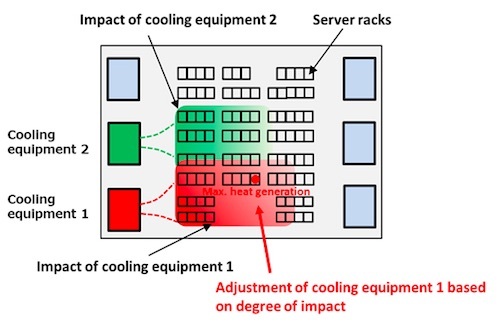 When a trial of this newly developed air cooling control technology was conducted in a 300-rack Fujitsu datacenter during actual operations, it was able to reduce energy consumption needed for cooling by 29% compared to previous operating conditions . Based on these results, calculating the effects for a 1,000 rack datacenter that uses 70 million kWh/year for servers and 22 million kWh for cooling, energy savings of 6.4 million kWh/year can be expected. With this new technology, Fujitsu should be able to contribute to mitigating the impact of global warming by reducing energy consumption in datacenters, where power usage is expected to increase in the future. Fujitsu Laboratories will be rolling out this newly developed cooling control technology to datacenters operated by Fujitsu Limited beginning in 2019, and simultaneously plans to incorporate the technology into a computing system that delivers low-energy, efficient cooling management.